Stems to 3 m; bark persistent, leathery. Leaves green; blade sharply 3-angled in cross section, widest proximal to middle, ad-axial side concave, outer angle serrate near apex, 5-11 × 1-1.5 cm. Inflorescences: pedicel 20-60 mm. Flowers 8-10 cm diam. ; calyx lobes 10-60 mm; outer 2 lobes sharply 3-angled in cross section, abaxial angle serrate near apex, 30-60 mm; inner 3 lobes smaller, with membranous margins; petals (including petaloid staminodia) 100-200, yellow, aging pink, 2-4(-5)-seriate, 30-40 mm; stamens 100 per series, yellow, 4(-7)-seriate, simple to plumose, 6-8(-12) mm; anthers yellow; stigmas radiating out over fruits, 8-15 mm. Fruits yellowish, clavate to subglobose, depressed apically, 20-35 mm. Seeds ca. 1000. 2n = 18. Flowering year-round, mostly spring. Coastal dunes, bluffs and terraces, margins of estuaries; 0-100 m; introduced; Calif., Fla.; Mexico (Baja California); South America (Chile); Europe; s Africa; Pacific Islands (New Zealand); Australia. Carpobrotus edulis is extensively planted in gardens and along highways and is also used for dune and bluff stabilization. An invasive, introduced species escaped from cultivation, C. edulis hybridizes with other Carpobrotus species. 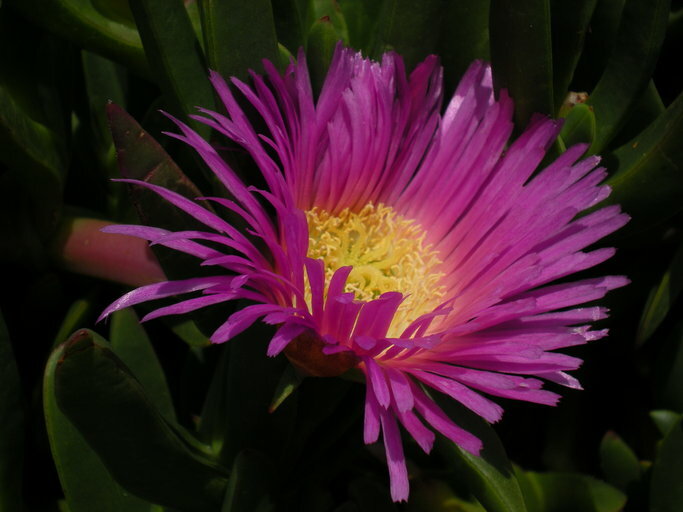 According to W. Wisura and H. F. Glen (1993), pink-flowered plants are seen in the wild only when C. edulis comes in contact with species of Carpobrotus with purple flowers.